In a recent study, researchers found that women with mild obesity (a body mass index of 30) had a 35% greater risk of headaches than those with a lower BMI. Severe obesity (BMI of 40) upped the chances to 80%. Certain traits, including rigidity, reserve and obsessivity may make you headache-prone. If that sounds like you, it could be time to sign up for relaxation training. Weekend or “let-down” headaches can happen when you take a break from your routine, says Alexander Mauskop, M.D., founder and director of the New York Headache Center and co-author of What Your Doctor May Not Tell You About Migraines. Ease into the change by keeping your sleep time as normal as possible—you’ll end up feeling more rested than if you stay in bed until noon. It’s not just arguing over paint colors that can give you a headache; fumes from traditional paints can trigger pain. Many companies now make nearly odorless, low-VOC (volatile organic compound) formulas, like Benjamin Moore’s Natura line or Devoe’s Wonder Pure. You don’t have to drink gallons of water to stay hydrated, says John La Puma, M.D., author of Chef MD’s Big Book of Culinary Medicine. “I’d love it if people got more water from eating fruits and vegetables because then they’d get all the other good things that come with them,” he says. We know you’re busy, but hunger is a common headache trigger. 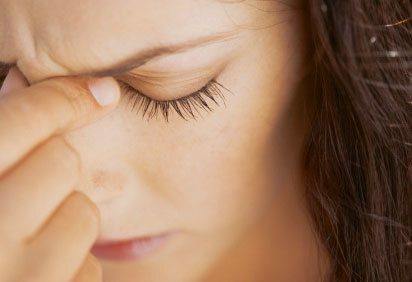 A little can help headaches but too much can trigger them, New York City neurologist Audrey Halpern, M.D., says. If caffeine is causing your pain, gradually cut back until you have caffeine no more than two days a week. A recent Swedish study showed that those who were inactive were more likely to get headaches than those who worked out. Aim for 20 to 30 minutes of cardio a day, five days a week, to relieve stress, send blood to the brain, and get feel-good endorphins flowing. Exercise may be a trigger for some people, so consult your doc first. One large study says those who slept an average of six hours a night tended to have significantly more severe and more frequent headaches than those who got more z’s. Everyone reacts differently, but some foods are known to trigger headaches for many people—and others (especially those rich in magnesium) seem to help prevent them.